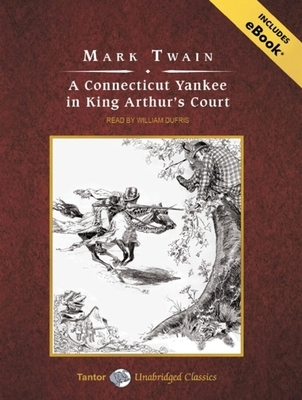 A Connecticut Yankee in King Arthur's Court is both a whimsical fantasy and a social satire chock-full of brilliant Twainisms. Hank Morgan, a nineteenth-century American-a Connecticut Yankee-by a stroke of fate is sent back into time to sixth-century England and ends up in Camelot and King Arthur's Court. Although of average intelligence, he finds himself with knowledge beyond any of those in the sixth century, and he uses it to become the king's right hand man and to challenge Merlin as the court magician. Astounded at the way of life in Camelot, Hank does the only thing he can think of to do: change them. In his attempt to civilize medieval Camelot, he experiences many challenges and misadventures. Mark Twain is the pseudonym of Samuel Langhorne Clemens (1835-1910), American writer and humorist, whose best work is characterized by broad, often irreverent humor or biting social satire. Twain's writing is also known for realism of place and language, memorable characters, and hatred of hypocrisy and oppression. William Dufris has been nominated nine times as a finalist for the APA's prestigious Audie Award and has garnered tweny-one Earphones Awards from "AudioFile" magazine, which also named him one of the Best Voices at the End of the Century.